There’s a Raging Epidemic – What Can You Do to Protect Yourself and Your Loved Ones? The Metabolic Syndrome may not kill as fast as Ebola but ~2/3rds of people have it! What is the Metabolic Syndrome? In 1977 Herman Haller noticed that people who were having heart attacks had common cluster of symptoms including central obesity, high blood pressure, high blood sugars, high serum triglycerides and low HDL Cholesterol Levels (notice LDL Cholesterol the supposed “bad Cholesterol” was not mentioned). This cluster of symptoms became known as “The Metabolic Syndrome”. Research since has shown that the metabolic syndrome starts with increased Abdominal fat (Viceral fat – around and in the internal organs of the gut like the liver, kidneys and pancreas). This causes the release of multiple “inflammatory mediators” that cause “insulin resistance”. This then leads to the other symptoms of the syndrome and with time inevitably to pre-diabetes and diabetes. Here’s a quote from the Wikipedia on the Metabolic Syndrome “It is common for there to be a development of visceral fat, after which the adipocytes (fat cells) of the visceral fat increase plasma levels of TNF-α and alter levels of a number of other substances (e.g., adiponectin, resistin, and PAI-1). TNF-α has been shown not only to cause the production of inflammatory cytokines, but also possibly to trigger cell signaling by interaction with a TNF-α receptor that may lead to insulin resistance”. In 2012 the CDC estimated 34.2% of Americans had the Metabolic Syndrome in this Study. I think the number is much higher as the CDC also just released this report showing that 40% of all adults and 19% of children in the US are obese and anyone categorized as obese is assumed to have the metabolic syndrome. You can also be thin and have the metabolic syndrome. This is called TOFI (Thin on the Outside, Fat on the Inside referring to Viceral fat). 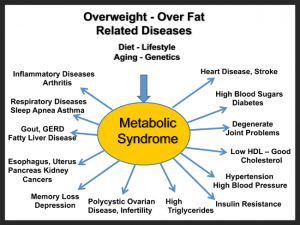 What causes Metabolic Syndrome? From my extensive study of the literature the only suspect that fits all the data I have seen is sugar. 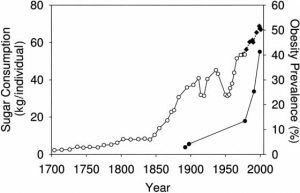 Here’s a graph of how obesity has followed increase sugar use in the United States. And here is a graph shows how closely the rise in diabetes has followed the rise in sugar consumption. That little downward blip in sugar consumption on the end is because the Sugar Industry pressured the FDA into changing how they calculated sugar consumption. I don’t think anyone really believes sugar consumption has gone down recently. 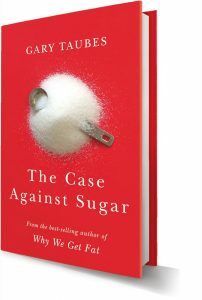 This and the complete body of evidence implicating sugar as the prime driver of the metabolic syndrome may be found in Gary Taubes’ wonderful recent book “The Case Against Sugar”. What is the financial cost of this Pandemic (worldwide epidemic)? $245 Billion was spent on diabetes care alone in the US up from $174 Billion in 2007 (a 41% increase in 5 years). $320 billion in healthcare costs and lost productivity can be linked to cardiovascular disease which is also primarily caused by the metabolic syndrome. According to the World Health Organization the number of people in the world with diabetes has risen from 108 million in 1980 to 422 million in 2014. According to the CDC “More than 100 million U.S. adults are now living with diabetes or prediabetes, according to a new report” Because of this in the United States our Medicare and Medicaid programs will soon be bankrupt without a massive infusion of funds that could significantly impair our economy. The metabolic syndrome is making more and more workers unfit for work at a younger and younger age. Likewise they are collecting benefits at a younger and younger age while our pharmacological treatments for diabetes while not curing the condition prolong their lives putting tremendous demands on the system that will down the road render it insolvent. Everyone in the world needs to wake up to this disaster caused by sugar! 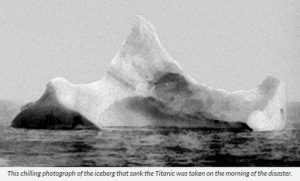 This is an “Iceberg Dead Ahead” Moment in history. Because the metabolic damage can be permanent you may need to eat this way for the rest of your life. Some people with mild early symptoms may be able to back off from these restrictions after the goal weight has been reached and the symptoms disappear. The viceral and liver fat quickly respond to these approaches but sometimes the damage can remain for life the limitations need to continue. Here is a list of some of the diseases linked to the Metabolic Syndrome. Click on each disease for the article supporting the connection. BLINDNESS – “Diabetic retinopathy (DR) is a leading cause of vision-loss globally. Of an estimated 285 million people with diabetes mellitus worldwide, approximately one third have signs of DR”. KIDNEY FAILURE/DIALYSIS – “In the United States the two leading causes of kidney failure, also called end stage kidney disease or ESRD, are diabetes (also called Type 2, or adult onset diabetes) and high blood pressure” (both are caused by insulin resistance in most cases). SLEEP APNEA(OSA) – Research demonstrates the likelihood of a relationship between type 2 diabetes and obstructive sleep apnoea (OSA), the most common form of sleep disordered breathing. The IDF consensus statement on sleep apnoea and type 2 diabetes aims to raise awareness of the association between the two conditions, which have significant implications on public health and on the lives of individuals. HEARING LOSS – A recent study found that hearing loss is twice as common in people with diabetes as it is in those who don’t have the disease. Also, of the 84 million adults in the U.S. who have prediabetes, the rate of hearing loss is 30 percent higher than in those with normal blood glucose. PSORIASIS – Patients with psoriasis were more insulin resistant compared with healthy control subjects. This supports that psoriasis may be a prediabetic condition. LOW SPERM COUNT – There is now emerging evidence that male obesity impacts negatively on male reproductive potential not only reducing sperm quality, but in particular altering the physical and molecular structure of germ cells in the testes and ultimately mature sperm. 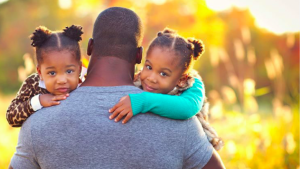 Recent data has shown that male obesity also impairs offspring metabolic and reproductive health suggesting that paternal health cues are transmitted to the next generation with the mediator mostly likely occurring via the sperm. ERECTILE DYSFUNCTION – Erectile Dysfunction (the inability to get an erection) has also been linked closely with the metabolic syndrome. Enlarged Prostate – The enlargement of the prostate gland with it’s accompanying, painful, difficult and frequent urination with frequent nighttime awakenings to urinate is seen much more commonly in people with the metabolic syndrome. Early Onset Sexual Maturity in Children – The appearance of sexual markers such as pubic hair, body odor and increased oil production in children called “Adrenarche” a part of the puberty process is driven by male hormones and normally starts around 8 years old for girls and 9 years old for boys. In children who develop the metabolic syndrome (an ever increasing problem) it tends to happen earlier. According to the Wikipedia this can be a problem because there are studies showing a higher incidence of a condition called Polycystic Ovarian Disease, a painful disorder causing menstrual irregularities and infertility in girls who experience premature adrenarche and more acne problems in both boys and girls. Tumors of the Adrenal Glands – In 4-10% of people who have an abdominal CT Scan or MRI, unexpected tumors are seen on the adrenal glands which sit on top of the kidneys. Since they were just noticed incidentally they are called “Incidentalomas” but unfortunately 5% turn out to be malignant. The recent study cited (click the text in orange) shows that they have been found to be much more common in the Metabolic Syndrome. 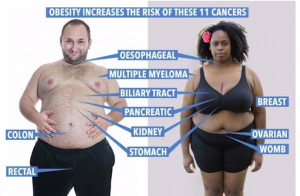 Many tumors have insulin receptors and of course people with the metabolic syndrome have much higher insulin levels. How does the Zero Carb diet (a diet of meat, eggs, cheese and butter) I follow fit into solving this problem? I was a total sugar addict for 62 years. The literature suggests that total abstinence is the most successful strategy for beating addictions to substances. Zero Carb in my opinion has been shown to bring health and vitality and it completely elimintates sugar from the diet. The bottom line is that the health and economy of the world is being wrecked by a substance at least as addictive as heroin or cocaine – SUGAR. We all need to do something soon or the collision with the iceberg is inevitable! Discuss Health and Nutrition questions with the Zero Carb Doc a retired Family Doctor. You could not have explained it any simpler…everyone loves pictures. Now,do we ‘sit on the Titanic deck’, lulled by the tune the AMA/FDA continues to play pretending there is no collision approaching, or do we grab a ZC style ‘lifeboat’? I am trying. Thanks for a healthy vision Paul. My thought on reading this, was how do you limit protein when on a zero carb diet? Unfortunately for me the damage is already done and I am trying to live my life as healthy as possible whilst battling DM and CKD. I want to stay under 115 grams of protein personally because I would like to weight in the 77 kilogram (170 lb) range. 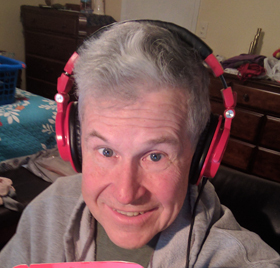 The way I came up with 115 is by multiplying 1.5 grams of protein per kilogram per day times 77 kg which gives me the 115 grams of protein per day. In January of 2016 I decided I needed to cut my protein if I wanted to get past the plateau I was stuck at of 210-220 lbs. What I quickly realized was that if I ate lean meats like chicken, most pork roasts, most steaks and beef roasts that my protein limit allowed me very little food and I just wasn’t as satisfied as I wanted to be. I also saw people like “Butter Bob” eating tons of fat while the weight melted off. The other piece that brought me to where I am is reading more and more about how important animal based omega-3 fatty acids are for overall health and especially brain health. So I started looking for ways to increase fat and Omega-3 in particular. I noticed things like for example and ounce of Oscar Meyer beef hot dogs (67 mg Omega-3) has more than twice the omega-3 content of an ounce of ribeye steak (29 mg). Even richer sources of Omega-3 include bacon fat, butter and eggs all of which I try to maximize in my diet. So here’s how I currently eat to stay under my 115 gram protein ceiling. I try to eat foods that average out to around 4 grams of protein per ounce and here is the list of foods I have come up with: fatty beef ribs (I try to find racks that are almost totally covered with white on the concave side, these are the fattiest). I eat a couple of beef ribs almost every day. I occasionally have beef short ribs but I think they may be closer to 5 grams per ounce (not bad) but I tend to go for the long ribs. The other thing I eat quite abit is pork belly. Pork belly is normally sliced very thin and we call it bacon. I buy the full belly and slice 1/2 inch slices and sear them in bacon fat with a spicy rub then bake them in the oven with my ribs. Pork belly is around 3 grams of protein per ounce, very high in omega-3 and delicious. Everybody always asks about bacon. Yes I eat it but it’s 3 grams of protein per slice and 11 grams of protein an ounce so you definitely have to watch it with bacon. The reason it is so high in protein is because it has almost no water in it, it’s basically pork jerky. Also a lot of the fat that is in my pork belly gets cooked out of the bacon strip and winds up in the pan. Now I know many of you are quite busy and cooking the ribs is time consuming so here are some of the more convenient foods I regularly eat and with the exception of Tilamook Extra Sharp Chedder (6 grams protein per ounce) are all 4 grams of protein per ounce or less. All Beef hot dogs (Hebrew National, Vienna and Oscar Meyer are my favorite brands), Boar’s Head Knockwurst. All kind of sausages I just check the protein per ounce and if it’s under 5 and they have no fillers like textured soy protein or oatmeal (which is in Earl Campbell sausages) they meet my criteria. If it says low fat on the front don’t even bother checking, it’s more than 4 grams of protein per ounce. Many cold cuts meet the 4 gram criteria. I like Beef bologna and salami. I sometimes get liverwurst. 27% fat hamburger is 4 grams protein per ounce and I often find it on sale for $2/lb and stock up. Fried eggs are under 4 grams protein per ounce. As to how much I eat. I find that 10-12 ounces of food at each of my 2 meals is more than enough to fill me up and keep me satisfied. at an average of 4 grams of protein per ounce that’s 40-48 grams of protein per meal and max 96 grams of protein per day. If I do eat steak, I eat a smaller piece (8 ounces or less per meal but I put a stick of butter near my plate and put a generous slice of butter on each bite of steak to make up for the leanness. So that’s how I do it. What about the sugar in products like the hot dogs? I often eat beef hotdogs (whatever is on sale) and they usually have about a gram of some kind of sugar per dog. The cells in the hot dogs are not completely dead. They turn grey when they are dead. That sugar was put there to extend the shelf life until you could eat them. They initially have about 1 carb per ounce worth of sugar but by the time you eat them there is much less because the meat cells in the hot dog have burned most of them. It is not a problem for a Low Carb, High Fat diet. The diet has to be proven that is beneficial without debate. Sotirios this diet has been proven by the Coastal Inuit Eskimos, the Maasai of Uganda, and the Nenets of Siberia among many others. All eat a high fat almost totally meat based diet and for those who follow the traditional diet heart disease, diabetes, and cancer are almost unheard of. Observation has shown the development of of all these conditions as soon as sugar is introduced into their diet. These are called “Natural Experiments” are a very strong form of scientific evidence, much stronger than the Observational Studies used to support a Low Fat, High Carbohydrate diet. You have got to be a really wonderful man, giving us other mortals all the help that you give to us. Thank you so very much.